(Nanowerk News) Scientists working at Queen Mary, University of London, have developed micrometer-sized capsules to safely deliver drugs inside living cells. In the future, this technique could allow full courses of prescription drugs to be effectively 'shrink-wrapped' and buried under the skin or inside the body. These "micro shuttles" can be loaded with a specific dose of medication and be opened remotely, releasing their contents. Using this new technique, drugs - like insulin for managing diabetes - could be implanted inside the body for use when they are needed. Their release could then be prompted by a biological trigger like a drop in blood sugar levels, or activated manually with a pulse of light. PhD student Matthieu Bédard and Prof Gleb Sukhorukov of Queen Mary's School of Engineering and Materials Science have proved this new technique to work in living tissue by delivering fluorescent test-molecules in light-activated capsules. The work is in partnership with Dr Sebastian Springer at Jacobs University in Bremen and colleagues from the Max Plank Institute of Colloids. The findings are reported in the October issue of Small ("Controlled Intracellular Release of Peptides from Microcapsules Enhances Antigen Presentation on MHC Class I Molecules"). Matthieu Bédard said: "The main advantage of using such microcapsules is that they can be designed to be very stable inside the body, protecting their contents. This is particularly important for the many medications that are rapidly degraded or altered by the body. These capsules can be used to 'store' drugs in the body for later use." The capsules, which have a diameter of two micrometers (about the size of a bacterium), are built by wrapping strands of a metabolism-resistant material around spherical particles, which are then dissolved in acid, leaving behind an empty container. To fill the capsules, the scientists heat them in a solution that contains the desired drug compound. This makes them shrink and traps some of the solution and compound inside. 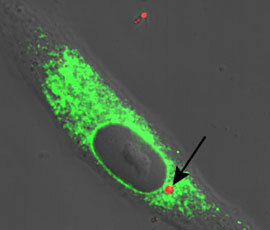 The loaded capsules are introduced into live cells by a technique known as electroporation - a tiny electric shock - which makes the cell walls permeable for micrometer-sized particles. The cells are unharmed by this treatment and retain the capsules. In this experiment, the capsules were exposed to an infra-red laser beam that does not affect the cell but is picked up by nano-gold particles in the capsule walls, changing their structure and releasing the micro shuttle contents. Prof Gleb Sukhorukov said: "This new technique could have many biological applications, including delivering DNA into cells for gene therapy. The capsules could also be filled in with magnetic particles that collect and extract miniscule samples from inside cells. Other applications could see patients needing internal medication after surgery being administered drugs without the need for further invasive procedures or hospital visits. "However, there are still questions about how to direct the capsules to the right cells as well as finding a way to make capsules that are safe for human use. It is possible that we will see useful applications for this technology being tested in the next five years."